Dark brown steatite, fashioned on a bow-driven lathe using abrasives and abrasive-charged tools. 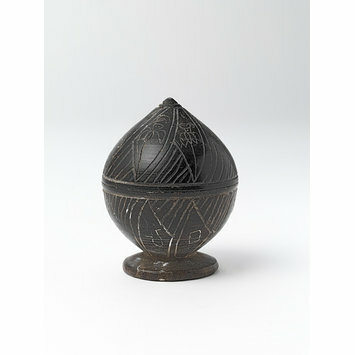 An half-egg shaped reliquary body, standing on a round foot with a flat base and a sloping upper surface. The interior has been hollowed out and the rim has been shaped to give a raised inner ring to enable a cover to be seated securely. There is a large chip off the rim, with most material being lost off the inner wall. 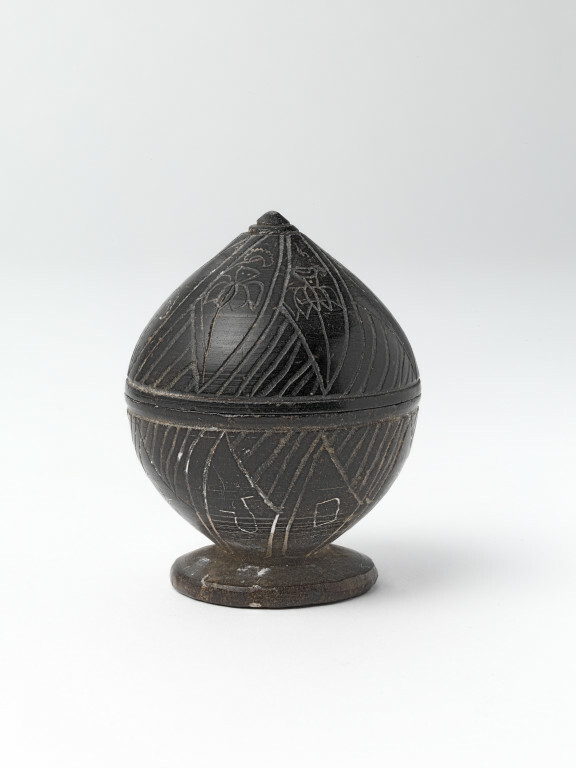 It has been fashioned in dark brown steatite and the outer surface of the ovoid body has been engraved with slanting lines and various characters or script. It was found inside the relic casket, No. 219-1921 I.M. , by Gen. Cunningham and Gen. Maisey about 1851, in the Stupa No. 2 at Sonari, 6 miles S.W., of Sanchi, Bhopal State, Central India. The casket may date from about the year 200 B.C., and the stupa may be a few years later. Diam. 1 1/8 in., H. 2 1/8 in. (Maisey Collection). Relic casket of black steatite, turned on the lathe, containing a small piece of calcined bone. It was found inside the relic casket, No. 219-1921 I.M. , by Gen. Cunningham and Gen. Maisey about 1851, in the Stupa No. 2 at Sonari, 6 miles S.W., of Sanchi, Bhopal State, Central India. The casket may date from about the year 200 B.C., and the stupa may be a few years later. Diam. 1 1/8 in., H. 2 1/8 in. (Maisey Collection). In the shape of a lotus-bud on a circular disc-foot. The upper part is incised with seven triangular compartments in each of which is a lotus-flower, a lotus-bud or a lotus-leaf beside a hatched triangle. The lower part is divided into eight similar panels, each containing in the upper part a hatched triangle and in the lower part one or two syllables in the early Brahmi character, of the following Pali inscription:- 'Sapurisa(sa) Ala bagirasa', i.e., [the relics] of the Emancipated Alabagira. Nothing certain is known of this follower of the Buddha. The relics of an Apagira were found in Stupa No.2 at Sanchi, and it is possible that the two relics are from the body. One of the Buddha's converts was Alavaka the cannibal of Atavi. Willis, Michael. Buddhist Reliquaries from Ancient India. London : British Museum Press, 2000. ISBN 0 7141 1492 8. p. no.87 and fig.96.